This Stunning style's stuck with us! Have you considered rocking the red carpet and showing off your airy grace of iro and buba styles? Then, you must have been missing some of the latest in the style trends. 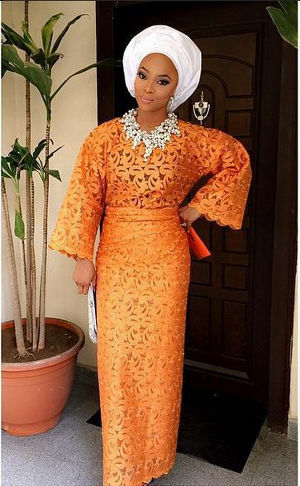 Iro and buba style is one of the most stunning Nigerian traditional attires around. Oh yea, if you don't believe me on that, then you gotta to check out Toke Makinwa and see how she pulls it off. I guess you probably want to make you take a kiwi flight to your tailor right now! Cool! That's what we are going to show you in this post. So, stick around and check out these different latest Nigerian iro and buba styles. What top 5 colors go with beige clothes? But instead, they are the cynosure of all eyes when worn as Aso Ebi dress by Nigerian women for a wedding, housewarming, naming ceremonies and a host of other events. 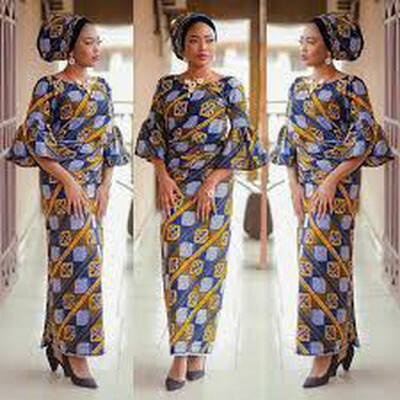 The traditional buba wear has a round collar and straight but wide sleeves while the iro is a long and wide wrapper to complete the stylish look. 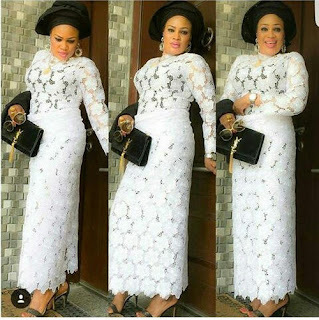 This stunning cord lace iro and buba styles is one! 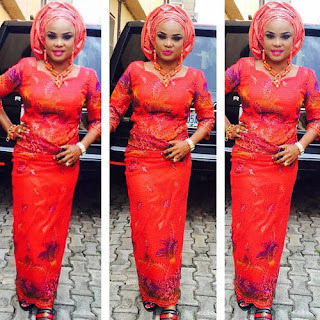 As much as the traditional iro and buba styles are gorgeous. African fashion designers are talented freaks - Did I just say that?. Okay, what I mean is that they can bring out a gorgeous style appeal out of the rock and kick out the dim out of the blues. 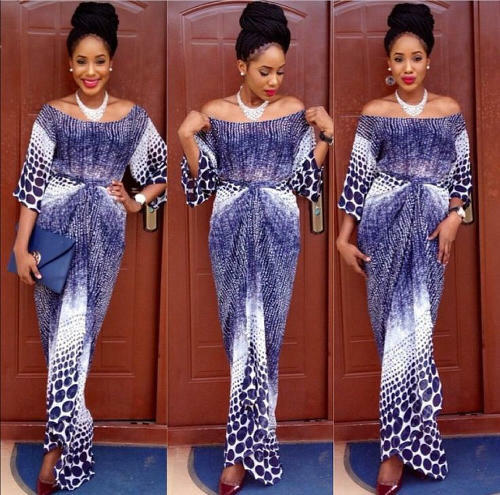 So, let's check out some of the modern trends in Nigerian iro and buba styles. But, a warning! These styles are going to tip you off your feet. The first style that comes on top is this lovely chiffon iro and buba style. It's also called the tulip style with the wrapper knotted in the front. 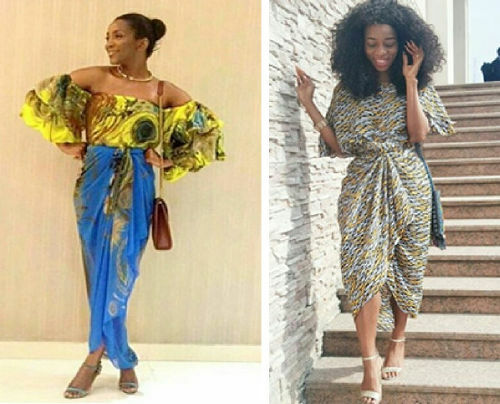 The tulip chiffon iro and buba styles have the most appeal from young Nigerian women and socialites. The long narrow long sleeve, and the slim fitted bodycon trunk show off your nice figure. The collar can also come off with a wide v-neck shaped design. This fitted iro and buba style is one of such. Now, if you rock the bodycon iro and buba cord lace styles to a wedding ceremony, be ready for a tussle cos, you're probably gonna make the bride feel jealous. 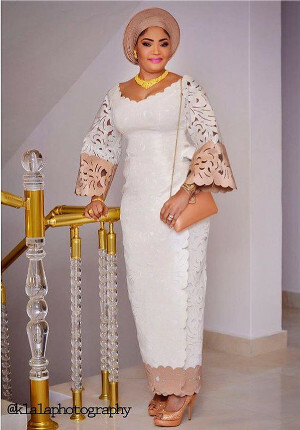 One of the latest iro and buba styles that appeal most to fashion-conscious Yoruba and Igbo women is this gorgeous iro and buba styles with flared sleeves. 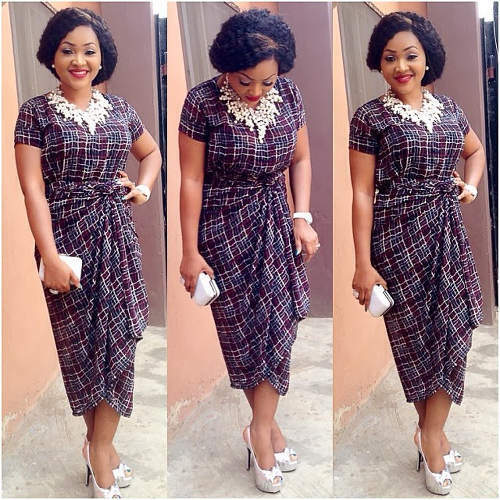 This style that looks really good on any lady - irrespective of the size. The figure 8 shaped model, a slim pretty damsel of the beauty with a killing curve. Just anyone can pull off this look and it comes with a cinch. You can even sew it with different kinds of fabrics. But Lace and Ankara styles are pretty common . 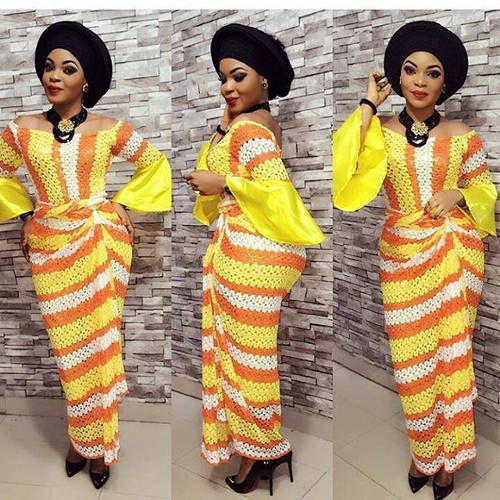 Below is a lovely picture of Ankara styles of iro and buba with flared sleeves. Now, if you want to go for lace iro and buba style, your shape definitely comes into the factor. That's because, lace fabrics do a little job of overstretching the body volume, thus making the wearer look a bit more voluminous than she really is. So, a good way to beat that is to go for a bodycon design for your buba. It also helps to pick a lace dress with small patterns compared to big patterned lace fabrics. Iro and buba styles are cool with different color options and patterns - and that also depends on the fabric from which it is sewn. For iro and buba Ankara styles, they come in various patterns, designs, and appeal and yes they are stylish for sewing your traditional and modern iro and buba dress. 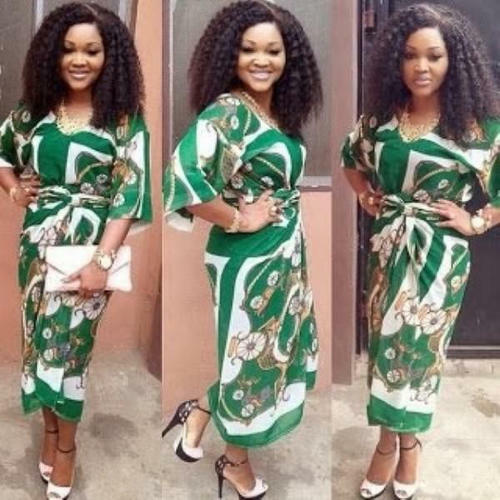 Check out these Tulip Ankara Iro and Buba style from Mercy Aigbe. 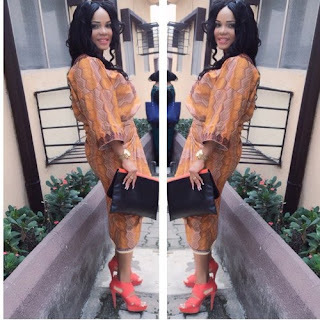 You need to check out this post to see what you can pull off with the latest Ankara styles. Nigerian lace styles are also an elegant choice of lush for Nigerian women most especially Hausa, Igbo and Yoruba. You don't need to look any further. You can go to any length with your choice of colors; black, white, red or purple dress. 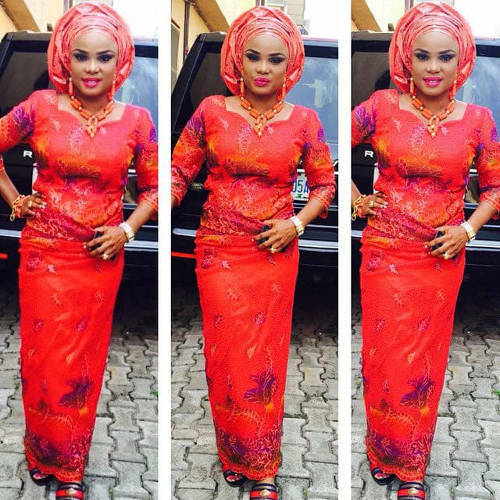 Just see how Iyabo Ojo pulls off the glamour. Multi color lace fabrics are also cool. Here's one. What about iro and buba styles sewn with black lace? 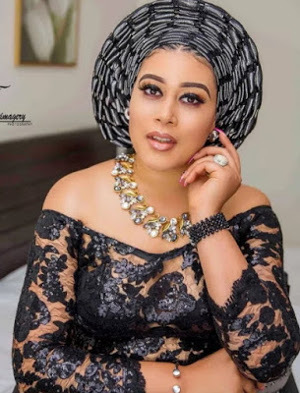 Oh yes, you may just take a look at this picture of the Nollywood actress Adunni Ade up there in this post. But, if you've got a taste for different colors, not too worry, you can experiment with colors that suit your taste. In fact beige, lilac and mauve colors are also up in the trend. To bring out the real glamour of an iro and buba attire, you must choose the right and matching choice of accessories to go with. And oh, yes, that doesn't just apply to the to the headgear [ gele alone ]. Now, that equally applies to all other choices of accessories. 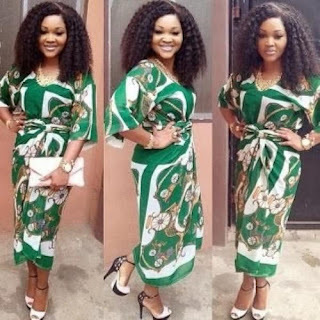 So, what accessories go with iro and buba clothes? A pair of a pair of flat heel women shoes, wedge, pumps or pointed heels are all great choices. But, for iro and buba lace styles, avoid pointed heels to avoid injuring yourself in case, you accidentally trip on your heels. The color of your bag should be the same as the color of your shoes. And yes, both should match the color of your dress. However, if you're not that good with matching colors, your best deal is a touch of neutral colors; white color shoes and bags, black colors shoes and bags, silver color shoes and bags and beige color shoes and bags are great choices. For the choice of gele to complete the look, same colors are easy choices. 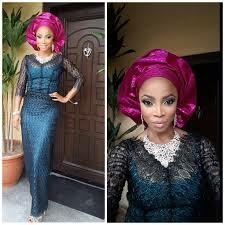 But, if you are good with color matching, you can opt for a gele of a contrasting colors. For other accessories, small size earrings, necklaces and pendant rings are definitely cool options to go with. Don't forget, you really, don't need to go overboard on these to create rock your totally gorgeous and stylish iro and buba trend.